It all began 6 years ago when Charlie started traveling. Fed up with working the 9 to 5 lifestyle in the construction Industry he decided he wanted to see the world and make a difference at the same time. Off he went to travel and volunteer and do as the saying goes to ‘kill two birds with one stone’, he wanted to give something back! This involved teaching in an orphanage in India, helping build an orphanage in Thailand and working with special needs children in Indonesia. After a life-changing 6 months, he went home to the UK as a different person. Sadly and unexpectedly Charlie’s beloved Father passed away in January 2014 and shortly after this Charlie decided to travel again, volunteering along the way. This continued to be his lifestyle until January 2018 when he decided to start his own venture in Thailand, on Koh Phangan, being the place he loved the most. 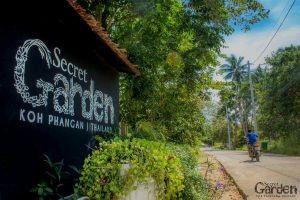 After looking at many different business opportunities’ he one day stumbled upon what now is Secret Garden. and so Secret Garden – DC Resort Co Ltd began its tale.